Did your mum ever tell you: “Don’t believe everything you read in the news”? We turn on the TV or scroll through social media, and we are bombarded by a plethora of information – some reliable, some not. A recent study by Pew Research Center found that nearly half of the adult population in many countries today uses Facebook as a news source. Having such ease of access to new information is great. You can discover a new fitness trend, or search for the latest workout or diet plan within minutes of scrolling through your social media feed. But sometimes it can backfire and get overwhelming if you don’t know how to filter through the sea of information. Personally I can be quite gullible myself, and am regularly tricked into believing April Fools’ jokes. However, even there is a limit to my naiveté. One day whilst scrolling through my Instagram feed, I came upon a post that made me shout various profanities. This particular post stated that “the position you sleep in is the likely cause of back and neck pain in most people”. It shows a person lying down with the spine specifically highlighted in red, creating the impression that there is pain or tissue damage in the spine. 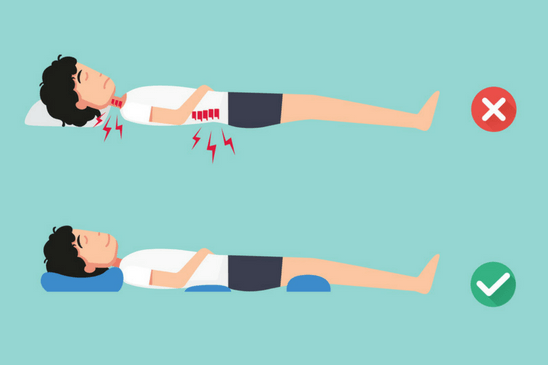 Then it shows the same person lying down with three different pillows wedged under his spine and neck to apparently “correct” his posture, claiming that the pain can be averted by purchasing those special pillows. Your spine and body is inherently strong and adaptable. Take images like these with a pinch of salt. The truth is that each one of us are unique and like to sleep in different positions. There is not one right or wrong position, or an ideal mattress or pillow type. Getting a well-rested night of sleep is more important than the position you sleep in. Posts like this could be very harmful for someone who is currently experiencing back or neck pain. This could cause apprehension and lead them to be unnecessarily stressed over the way they sleep. Another example would be an image that shows a person bending forward, with an “explosion” emoticon right at their lower back indicating a disc bulge or other tissue damage. The post implies that your back is inherently weak, unstable, or easily damaged by a move as basic as bending forward – which is completely untrue. Social media posts like these are designed to be shocking and evoke strong emotions in order to get comments, likes, and shares. Running is bad for your knees. Deadlifts are bad for your back. Resting is good for a bad back. You shouldn’t exercise if you’ve got arthritis. Recent evidence shows that running is not bad for your knees. Squatting with correct technique is beneficial at building strength in your legs which alleviates the stress on your knees. Deadlifts when performed correctly are beneficial in strengthening the lower back, making it less susceptible to lower back problems. Movement is best for a bad back. Bed rest is likely to worsen back pain and increase recovery time. Modified exercises that account for any physical limitations can help with weight loss, and strengthen the muscles around your joints, thus alleviating stress. Studies have shown that “the loss of 10 pounds of body weight can lead to a 40-pound reduction of pressure in the knee joints”. There is a lot of great information online, especially when it comes to health and fitness. However, you do have to be careful, as there are a few “snakes in the grass”. You should be judicious about where you are taking your information from. If you have a heart condition, you would see a cardiologist and seek information from a credible source such as the Singapore Heart Foundation, rather than from an Instagram profile named '@HappyHeartDoc4000'. Likewise, when looking for information on fitness, health, and nutrition, make sure you are using reputable sources with credible qualifications. The number of page followers does not replace accredited qualifications. Any post with dietary, nutritional, or health claims should ideally have links to supporting research. Be wary of fear mongering – your bodies are strong and resilient. Always check the qualifications of whom you are taking information from. It is best to seek physiotherapy, personal training, and nutritional advice from a qualified professional that you can meet face-to-face. There are no hard and fast rules when it comes to reaching out for professional medical or fitness advice. Typically, if your pain is worsening and things are not improving after a couple of weeks, it would be a good idea to contact your physiotherapist or doctor. If you are stuck for ideas and feel you need help, it is better to consult a professional than to suffer in pain alone. Kieran is a UK trained Physiotherapist with extensive clinical experience at UK’s NHS hospitals and clinics, as well as with professional football club Burnley FC. In Singapore, Kieran spent three years with Jurong Health Services working with the Intensive Care, General Medicine, Orthopaedics, and Sports Rehabilitation units. He also presented published research in that time. Subsequently, he was the Head of Physiotherapy at a private clinic before joining UFIT Clinic. Kieran is also a certified sports massage therapist, dry needling therapist, and kettlebell instructor.